I have to admit I was worried. I'm pretty tight with a buck, and ponying up the money it takes to buy an Ed Brown 1911 for a model I'd only handled but never actually fired was a stretch for me. But over the years it's been my pleasure to chat with Ed at trade shows, and I was able to borrow an excellent rifle from his company for a once-in-a-lifetime trip to Tanzania for Cape buffalo. (Not buying that .375 H&H after the trip ranks as one of my great firearm blunders of all time, especially since Ed's now out of the rifle biz, and I regret it to this day.) Plus, of course, I'm well aware of his company's reputation as a top-flight gun builder. No, what worried me was that I'd get my usual case of buyer's remorse, the feeling that I'd foolishly spent too much money for something I didn't really need. But as my fellow Californians know, time is slipping away. 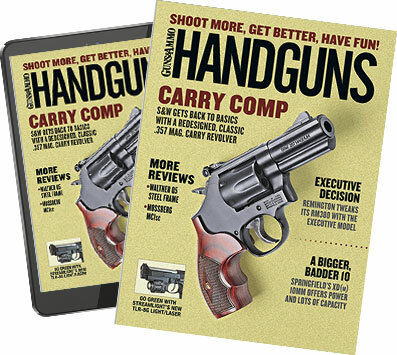 1911s don't lend themselves to the features the state requires in order for a new handgun to be on the "approved" list—particularly the magazine disconnect requirement. Therefore, it will soon be nearly impossible to purchase a new 1911 in this state. Time is running out on me as well, or at least as I look at 50 years old I feel that way. So I told myself, "Dammit, buy yourself a really good 1911 before it's too late," and for the reasons I mentioned previously—as well as thinking back on all the 1911 reviews I'd edited over the past several years at Guns & Ammo and now Handguns, along with what I'd learned from firing various 1911s at press events or those belonging to friends—I sent in my deposit for an Ed Brown California-approved Special Forces model. No sooner had I done that than I read Jim Tarr's review of the brand new Special Forces Grey in the August/September issue of Handguns—the same gun I'd ordered but with a gray Gen III finish. In his article, Tarr was slightly critical of Ed Brown's Chainlink pattern, saying it provided great lateral control but perhaps not as good vertical control as traditional checkering. Funny how seeds of doubt grow in direct proportion to cash outlay, and I worried that maybe I wouldn't be as happy with the gun as I'd hoped. Then I got the call from Turners gun shop that the pistol had arrived, and 10 days after filling out the paperwork, I rushed home with my prize. And the moment I pulled the pistol out of its soft case, I was pretty sure buyer's remorse was not going to be a problem. For one, the gun is just beautiful, from the matte black Gen III finish to the tasteful "Ed Brown" on the slide, to the gorgeous checkered wood grips. Every line on the gun perfectly executed. I belted on a holster and did a few draws and some dry-firing. Smooth—-no issues with the grip safety as I occasionally have with other 1911s. The ambi safety snicks on and off with precision, and the triggerâ€¦well, it's exquisite. The next day I headed to Angeles Range to start breaking it in. No accuracy test, no serious function firing, no drills. Just hang a target and shoot my new gun. It was awesome. Any reservations I had about the Chainlink were gone, and there wasn't a single "new-gun" malfunction. I think I did good.